There's a scene in Knocked Up where Paul Rudd and the guy who looks like he could be Shawn's slacker stoner brother are sitting on a park bench, watching kids blow bubbles. They marvel at how beautiful it is that kids can find such joy in something as simple as bubbles. Although I don't think they actually said "beautiful," rather something with a lot more profanity. I remember this with such clarity not just because it was the first movie we had seen in a theater in darn near six months, but because I can relate--kind of. When we first introduced Finn to bubbles, he was full of wonder and awe at these perfect, weightless spheres that seemed to emerge out of nothing. But, like all American children, the child grew jaded and wanted more. More bubbles, bigger bubbles, and more bubble horsepower. A simple wand and cup from Walgreens just wouldn't cut it anymore. So we got him this super-charged bubble blaster. The packaging promises "up to 1000 bubbles a minute!!!" (The exclamation points are theirs, not mind.) And boy, does it ever deliver. Here's Finn exploring the all-American joy of up to 1000 bubbles per minute. * As a funny aside, Finn got so excited that he put the bubble blaster in his mouth. When he tasted the soap, he started to cry, and big bubbles started coming out of his mouth. Happy time, originally uploaded by baggermanpc. This photo cracks me up. My dad took it when we were in Kalamazoo, and I think that he was trying to pose us for some nice mother/son shots. I mean, could I look like any more of a witch here? My eyebrows are pointing in "angry" position, my lip is out and my brow is furrowed. I'm looking at Finn like, "Stop wiggling and smile, darn it!" and he replies in pure agony. 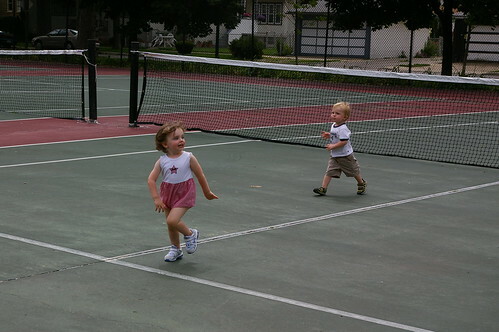 We were both feeling the onset of terrible twos that afternoon. There are so many reasons to love this video of Finn singing his ABCs. One is the frequent recurrence of the letter "W." Another is the fact that just prior to this, he smeared his entire face with my expensive, long-wear lipstick, leaving his face streaked red (which took forever to remove). Lastly, I love how he takes on a low voice when he is singing this particular song. Enjoy! That goat looks like Santos! IMG_5046.JPG, originally uploaded by lisabagg. 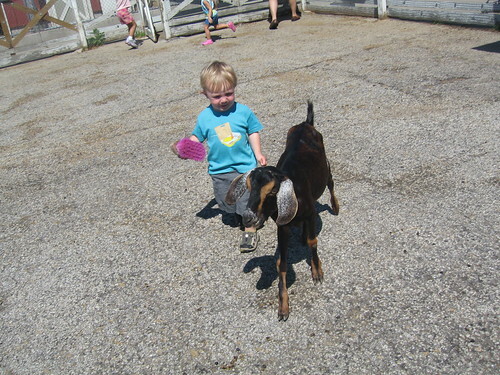 This weekend, Finn got to go to a petting zoo for the first time. In Finn's perception, this was way better than the actual zoo because he got to actually feed the animals, pet them, and even brush them. There were some kittens running around the farm, too, so he got to pet one and feel it purring, which actually kind of startled him. (But, one he realized the kitty was OK, completely delighted him.) He got really excited and started chasing the kitten around, saying "KITTY!!! HEEERRE, KITTY!!!" The kitty wisely hid just out of reach. In the goat's pen, he kept following this guy around saying "SANTOS! C'MERE, SANTOS! BRUSH!" He does kind of look like Santos, but isn't nearly as fat. Picture 9, originally uploaded by lisabagg. If I haven't been posting as much, it's because I've been working more than ever. And while I say that every month, it's now more true than ever. I'm pointing and clicking so much that I'm in danger of losing my hand to some kind of carpal-tunnel prescribed hook apparatus if I don't watch it. At least I really love what I've been working on. 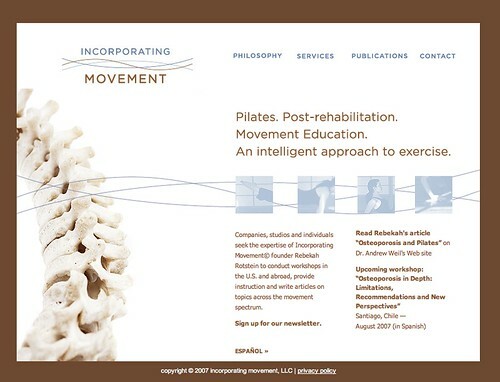 Yesterday, I launched the site for Incorporating Movement, the new business of New York-based Pilates instructor, Rebekah Rotstein. I used the design that Shawn created for the logo as the basis of the overall site design. I'm really happy how it all came together. I also worked with Bay Area artist, Lee Fenyves, to help him build an online store to sell his work, while refreshing the overall look and feel of his site. On top of this, there were several reviews for MomFinds.com Chicago activities for Kids Off the Couch. Also, a big project for Golin Harris that I am not yet at liberty to discuss, another project underway for Yahoo (my first huge client) that I will be able to discuss next month when it launches and yet another huge project for a new client that will be revealed next month. IMGP0204.JPG, originally uploaded by Daddy Shawn. When the temperature rises above 90 degrees (my car thermometer said 100) and there's no escape from the heat but a pool, you'd best cover up if your skin is alabaster and you plan on spending the entire fourth of July holiday in a pool. 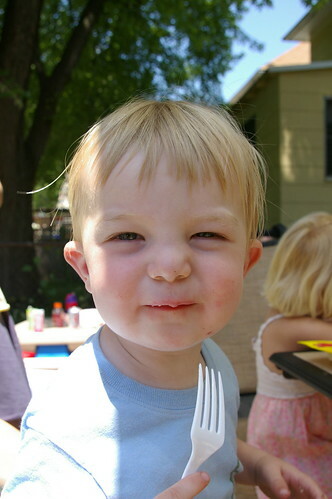 Seriously, this kid is so white, you can see his veins. I dressed my blonde-haired, blue-eyed son in a body-covering bathing suit, lathered him with sunscreen and took him to every pool in town this week. Here we are at Mr. J's pool in the city (Lisa Jones' dad) with some of our pals. Summer in Chicago totally rocks. We Chicagoans know that warm, sunny, days have a limited shelf life. (Ninety-three days, but who's counting?) That gives you the kind of feeling you get on vacation that tells you you'd best live it up. To get up early, stay up late, and eat all the ice cream you can. Because before you know it, summer will be over and you'll be beating down a snowdrift with a cheap Home Depot shovel. We went to Foster Beach this weekend with BOYS, and Grace, Tulio, Lis, Dan, Emma, and Shannon met us there. It was absolutely beautiful there. One advantage to having kids is that you can get up and go early, before all the hungover twentysomethings arrive. I couldn't believe how much room we had to ourselves. We found some prime real estate right on the lake, built sandcastles, and splashed in the water.